I like The Wedge salad - that classic salad with a hunk of iceberg lettuce and blue cheese dressing. It's as simple as simple gets with a bonus fresh and crunchy profile. This may be the only instance where iceberg lettuce is a truly acceptable use. Since the goal of this Fat and Happy Food Blog is to create new recipes from scratch, my plan was to play off the simplicity of that salad but vary it enough so the a new salad would stand on its own. Grilling the romaine lettuce gives a depth of flavor and a hint of warmth while also keeping a bit of the cool crunch; the tangy buttermilk and feta dressing covers the salty pow that commands attention. Grilling lettuce is a show stopper with the crowd too, so be prepared for the spotlight. 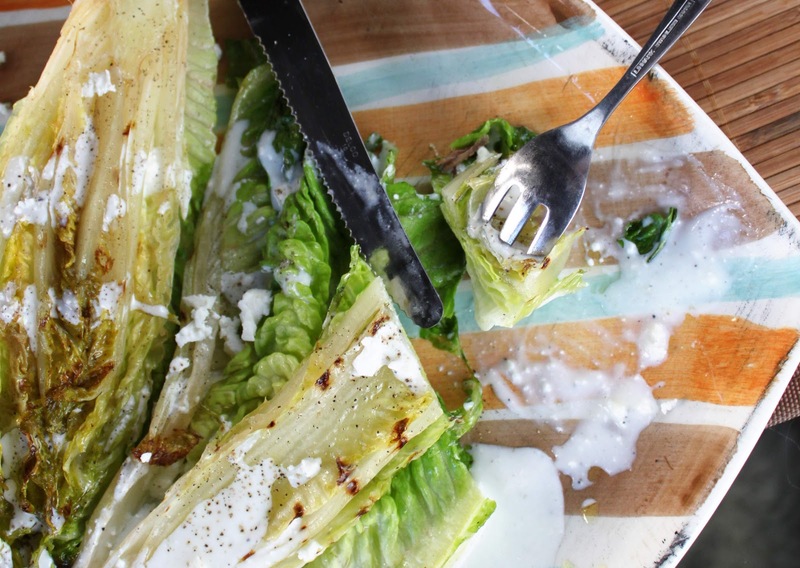 The Fat and Happy Grilled Wedge Salad - take your next barbecue up a notch! Tips and Techniques: Rinse the lettuce early in the day, wrap in a paper towel (keep in the fridge if needed) and let drip dry before grilling. If there is too much water left in the leaves, the lettuce will steam on the grill rather than sear. It doesn't have to be bone dry, but give each head a good shake before placing on the grill. Cut the romaine heads in half and rinse thoroughly with cold water; try to keep all the leaves in tact. Place on a paper towel to dry before grilling. Place the olive oil, rosemary and garlic clove in a bowl, set aside until ready to use or at least 20 minutes. Place the buttermilk, feta and a few turns of fresh black pepper in a food processor, pulse to combine for about 30 seconds. Keep chilled until ready to use. Preheat grill to medium-high heat. Brush the cut side of the lettuce with the garlic and rosemary infused olive oil, place the cut side directly on the grill. Grill for about 5 minutes (this is going to depend on your grill, the heat and the size of the lettuce); the goal is to obtain grill marks while not wilting the entire head. Remove from heat, drizzle with the buttermilk feta dressing and sprinkle with a little more feta and fresh ground pepper. Serve immediately. Note: 1 head of romaine lettuce could serve 4 as a side salad, but my preference is for a 1/2 of the head my myself. If you are not sure about how much dressing to make, start with 1 cup of buttermilk to 1 cup of feta cheese. Eyeball the cheese, you don't need to measure.